A little while ago we were invited to check out the new summer styles at The Children's Place. It's always fun to bring in the kids to see what new styles they're loving. This time it was bright, colorful and fun. The kind of clothes that make you want school to end yesterday. Since we live in the water in the summer, my youngest Madeline and I went straight for swim wear. Here's what we came home with! Madeline loved the ruffled bikini, flower flip flops, rainbow swim suit, butterfly rash guard set and pink ombre cover up. Because everything in the Children's Place swim section was adorable, she had free range to pick exactly what she wanted. Since Ellie was in school for the day, we shopped for her. She was super excited to see what we came home with! For Ellie we did a coordinating coverup with matching jewel flip flops, one shoulder suit, chevron suit and zebra tankini. Perfect for summer fun and will stay on while my little fish jumps in the pool again and again and again! A huge thanks to the Children's Place for providing us with gift cards to shop. Look for lots of pictures of our summer fun on Instagram coming soon! What are your favorite stores to shop for summer clothes? If you are like me you dread shopping for swimwear but you love to shop for the accessories! 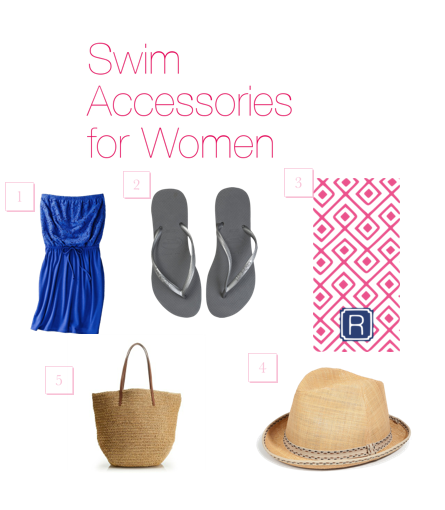 Today I am sharing five swim accessories that are sure to be a top pick for any momma on any budget. One: Lace swim cover up. The lace detailing gives this cover up a romantic feel. This versatile piece retails for $20 and is available in many colors to coordinate with any swim suit. Two: Comfy flip flops. For the price and comfort, you can't go wrong with a pair of comfy Havainas. You can even find matching pairs for your entire family. Three: Fun beach towel. I love ones with bright colors and bold graphics, especially from Haymarket designs. Their towels are made in the US and every one can be uniqely designed offering endless options. How fun! Four: Paul Smith straw hat. It's not your typical beach straw hat. What I like is that it can also be paired with a comfy tee and shorts while running errands or playing at the park with your children. Five: Straw bag from J.Crew. This classic bag will take you from the pool to lunch dates with your girlfriends all for only $50! What swim accessories make you feel confident on the beach or at the pool?